It was December 9, 2007 during our Christmas Party when I won the Grand Prize in my previous company. And this was the 32" LCD TV Sony Bravia. Of all the employees there, I thought I was the luckiest for having this expensive TV! No more talks on the story behind winning this Grand Prize (because I already tell you and posted it here the whole story) but if you really want to know how I won, you may read again my post, "Rocky De Bravia"! 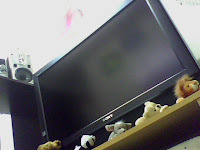 We started to use this TV only in March 2008. As expensive and as luxurious of it are the accessories needed by it. We need to avail Cable Service for this instead of the regular antenna for its reception. Well, it's almost one year together with my new LCD TV. Many want to see it. Many want to watch movie or TV programs with matching state of the art surround sound. So, I will let you again invade our home to see my Bravia TV! This how our Sony Bravia looks. Well on the first image, the whole image itself. On the next three, these were taken during the time I am watching a particular movie and TV Series. 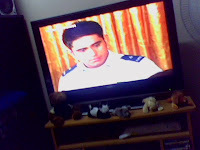 The first is the movie of bea Alonzo while the next two...well, I know you're familiar with it! It's the two David Garcia, JR and Dave of the hit teleserye, 'Tayong Dalawa'! 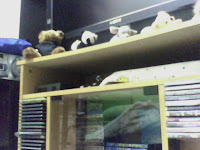 And of course, the shelf under it are the collection of my DVDs both music and movies!